Here’s another example of how the Everything Bubble, the persistent inflation of all risk assets, has simply been the result of Fed money printing. Here is the non-recovery. While banks use endless fiat loans to drive stock prices higher, a greater proportion of middle-class Americans find themselves unable to afford what most consider to be an entry-level middle-class lifestyle. At a time of rock-bottom joblessness, high corporate profits and a booming stock market, more than 40% of U.S. households cannot pay the basics of a middle-class lifestyle — rent, transportation, childcare and a cellphone, according to a new United Way study. 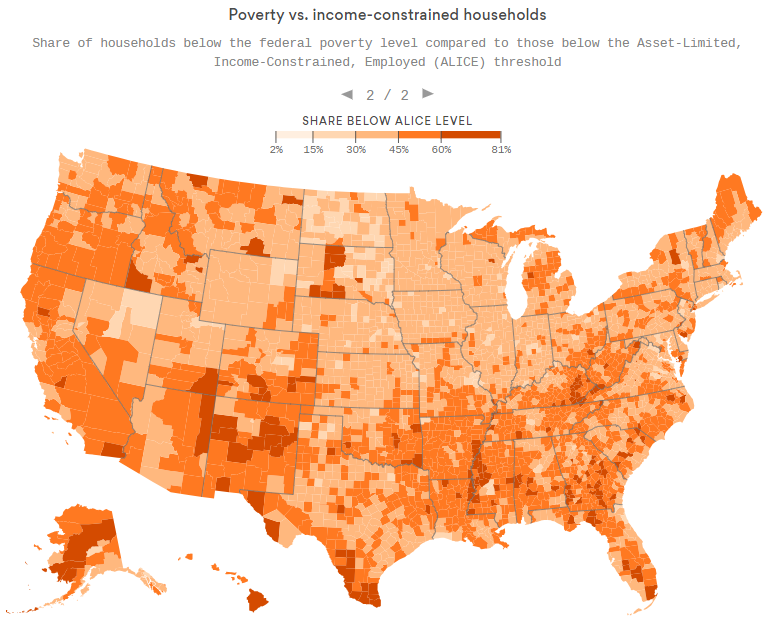 The study found a wide band of working U.S. households that live above the official poverty line, but below the cost of paying ordinary expenses. Based on 2016 data, there were 34.7 million households in that group — double the 16.1 million that are in actual poverty. Why it matters: For two years, U.S. politics has been dominated by the anger and resentment of a self-identified "forgotten" class, some left behind economically and others threatened by changes to their way of life. The study dubs that middle group between poverty and the middle class "ALICE" families, for Asset-limited, Income-constrained, Employed. These are households with adults who are working but earning too little — 66% of Americans earn less than $20 an hour, or about $40,000 a year if they are working full time. When you add them together with the people living in poverty, you get 51 million households.